On the 27th of January, 2011 OPERA organized in Brussels a seminar to present the recommendation document on risk indicators selection and quantitative targets to meet Sustainable Use Directive objectives. The authorities from the majority of the member states were represented at the seminar. 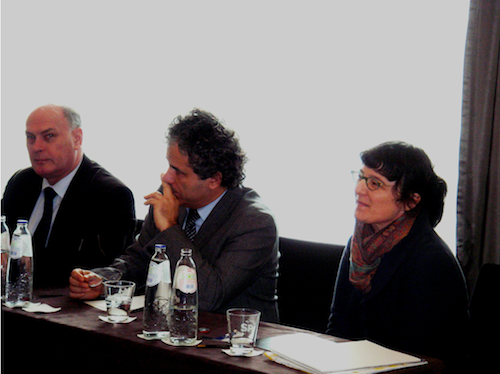 The panel discussion which followed the presentation of the OPERA report was conducted with the contributions of Patrizia Pitton, representing the European Commission DG SANCO, Luc Peeters the chairman of the COPA-COGECA working group on phytosanitary issues and Ettore Capri, Director of the OPERA Research Center. The EU directive 128/2009 requires Member States to develop a legislative framework and National Action Plan (NAP) with the aim of reducing the potential risk associated with pesticide use. OPERA’s seminar was mainly focused on the key objective of assisting member states authorities in defining a system to measure step by step improvements made in risk reduction, following the implementation of the Directive and its corresponding NAPs. The OPERA guideline for implementation document presented by prof. Ettore Capri, proposed for consideration a pragmatic and easy to implement toolbox of measures, indicators and quantitative targets to reduce the risk associated with pesticide use. In the intervention on behalf of the Commission, Mrs. Pitton, who stressed the relevance of the report and the novelty of the approach on indicators that OPERA suggested, in the monitoring of the progress achieved in risk reduction. She also mentioned the importance of a harmonized approach and the difficulty to achieve a balance between technical aspects, pragmatism of implementation and resources that can be used for monitoring. It is important reach such balance as to ensure visibility and communication with the farmers and with the general public on the progress achieved. Luc Peeters, in his intervention highlighted that authorities should provide workable solutions to the farmers and then create the framework through indicators to communicate the progress to the society. The indicators and targets should help also the authorities in the process of policy development. Furthermore he expressed his satisfaction on OPERA’s approach on multi-stakeholder consultation in the development of the recommendation. Questions were raised from the audience on the choice between using the modeling based approach in developing indicators or the pragmatic evaluation of different risk reduction measures as proposed by OPERA. The panel replied that both solutions should be taken into account in the future, as we have to strike a balance between costs and benefits and between theoretical models and simple and pragmatic ways to construct indicators. Generally, the report was well received by the audience and OPERA was encouraged to continue its work in providing support and recommendations of pragmatic solutions to build a sustainable agricultural system in Europe.